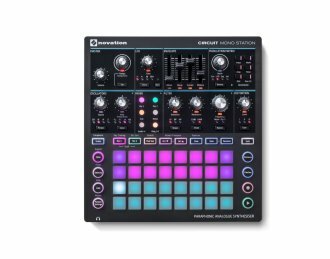 The Novation Circuit Mono Station is a paraphonic analogue synthesizer that originates from the Bass Station, with three sequencer tracks that benefit from the 32 velocity-sensitive RGB pads found on Circuit. The synth has two oscillators, three distortion modes, plus one multi-mode filter that can be high-pass, low-pass or band-pass. With Circuit Mono Station, the sync and tuning parameters of its two oscillators can be individually controlled. The groovebox also offers four waveshapes (sawtooth, triangle, square and sample + hold), a sub-oscillator, ring modulation and noise generation. Users can get the frequency band they want by applying high-pass, low-pass and band-pass filters with slopes of 12dB and 24dB. In addition, Circuit Mono Station introduces a meaty overdrive. Both monophonic and paraphonic modes are available, with each oscillator individually controlling its own sequencer. There is a choice of three sequencers: two oscillator sequencers and one modulation sequencer. Users can alter gate length, switch patterns instantly, choose sync rate and mutate patterns. Up to 64 patches can be loaded and saved on the device, right at the user's fingertips. Circuit Mono Station controls separate hardware via CV, gate and modulation outputs, and has MIDI I/O, so other MIDI gear can be connected. Via USB, Circuit Mono Station can be plugged into Mac or PC, where unlimited patches can be managed using Components. This feature turns Circuit Mono Station into a sound designer's dream. Create unique sequences with different presets and automation per step. 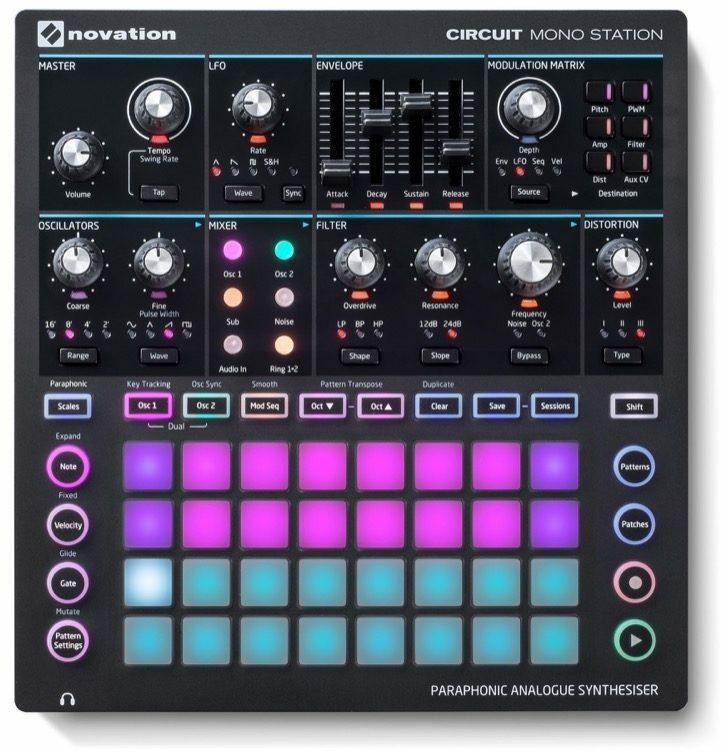 Using Patch Flip, Circuit Mono Station is also a fully-analog drum synthesizer. Program notes into the Mod Seq page to independently control your modular and CV gear with pitch and gate control via the CV/GATE output. The Circuit Mono Station LFOs allow you to decouple synced LFOs from key sync. This means sequences can benefit from longer LFOs staying in sync across several notes, perfect for making widely evolving musical phrases. LFO Clock Sync can also be controlled independently. You can choose to have legato or re-triggered envelopes. This choice gives an enormous amount of extra expression in your Circuit Mono Station sequences. Available until 11 PM (EST) today. Mention special code 1ZY-G3Q7 when you call.